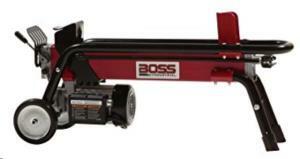 The Boss-Industrial electric log splitter is perfect for small log splitting jobs. Its 2hp motor delivers 7 tons of splitting power. It is able to split logs up to 20" long and up to 10" in. diameter. This portable machine is on wheels and weighs only 120lbs. * Please call us for any questions on our log splitter electric 7 ton rentals in Hillsdale and Ridgewood NJ.